The regions of Japan are not official administrative units, but have been traditionally used as the regional division of Japan in a number of contexts. For instance, maps and geography textbooks divide Japan into the eight regions, weather reports usually give the weather by region, and many businesses and institutions use their home region as part of their name (Kinki Nippon Railway, Chūgoku Bank, Tōhoku University, etc.). While Japan has eight High Courts, their jurisdictions do not correspond to the eight regions below. 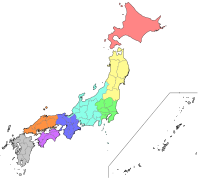 Each region contains several prefectures, except the Hokkaidō region, which covers only Hokkaidō.